All countries have an international airport close to the capital city. Kotoka Airport in Accra, Ghana is the busiest and there are regular flights from all major airlines. Alitalia, British Airways, Delta Airlines, Egypt Air, Emirates, Ethiopian Airlines, Royal Air Maroc, KLM, Lufthansa, South African Airways, TAP Portugal and Turkish Airlines all have regular flights to Accra. Most of the connections to Ougadougou, Lome and Cotonou go through Paris and flights are operated by Air Burkina, Air France and Royal Air Maroc. Consult a local travel agent to find out which airline offers the most suitable flight for you. 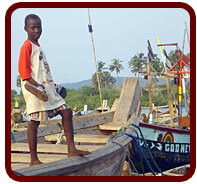 Royal Africa Travel is a travel agency offering cheap flights to Ghana and other African countries. They have an office in Amsterdam. Check www.royalafrica.com or call 0031-(0)20-6005181. Flying from Accra to other major cities in Ghana used to be relatively expensive, but has become much more affordable since new airlines, like Antrak Air (www.antrakair.com), Africa World Airlines (www.flyafricaworld.com), Starbow (www.flystarbow.com) and Fly 540 (http://www.fly540.com/) started offering domestic flights. To be able to travel to West Africa, you need to be in the possession of a valid passport which will still be valid 6 months after you return to your country. You also must obtain a tourist visa, please find a summary for the visa requirements below. A visa for Ghana needs to be obtained before your arrival, at the Ghanaian embassy or consulate in your home country. It is not possible to obtain your Ghanaian visa at the border if you arrive in a neighbouring country. However, since recently it is possible to obtain a visa upon arrival at the airport if prior notification is being made to the responsible institutions. Please note that these services are more costly than organizing your visa at the consulate or embassy in your home country. A 7 days’ tourist visa could be obtained at the Togolese border. If you are spending more time in the country or need to re-enter Togo after 7 days (for example, because of the visit of one of Togo’s neighbouring countries) we recommend to apply for the visa at the consulate or embassy in your home country or alternatively in Accra, Ghana or Cotonou, Benin. This might affect your itinerary since it takes 48 hours to receive your visa. It is not possible to obtain a visa upon arrival or at the border for Benin and Burkina Faso. Therefore, it will be necessary to apply for your visa at the consulate or embassy in your home country. Alternatively, you may decide to apply for your visa in Accra, Ghana. This is cheaper but might affect your itinerary since it takes 48 hours to receive your visa. For more information you can also check the website of the embassy in your country on www.embassy-worldwide.com. During your flight to Ghana every passenger is asked to fill in a Ghana immigration form which requires a contact addresses. You can use the Jolinaiko address or the address of your first hotel for this. Please note that the above information is subject to any changes, and therefore we are ready to give additional and tailor made advice if desired. You will always be required to show your International Certificate of Vaccination to the 'Health Officials'. Vaccination against yellow fever is obligatory and is expected to be clearly signed and depicted in your certificate. Also, protection against malaria is strongly recommended. Make sure you take prophylactic tablets and apply mosquito repellent and wear long sleeves in the evening and early mornings. Bring your mosquito net. Other optional (recommended) vaccinations are Hepatitis A and B, polio, measles, mumps, rubella, rabies, typhoid, diphtheria, tetanus and meningitis, and possibly cholera. In any case, consult your doctor or travel clinic specialist at least four to six weeks before departure. West Africa is very hot and dehydration and sunburn are your most likely afflictions. Drink plenty of water and make sure you are always carrying water with you. It is advisable to wear a hat and sunglasses, especially during the heat of the day. Drink mineral water from bottles exclusively. Be careful to check lid of these bottles in order to make sure they are not broken. It is not advisable to drink the mineral water packed in plastic sachets or tap water, since the quality is unreliable. Food poisoning is another common threat for travellers. Salads and ice cream are the most problematic products in the tropics, and except from the upmarket restaurants, try to avoid eating these products. Fish and meat that is not well prepared can cause serious health problems. Discuss the food safety with your local guide and take personal hygiene into account. We strongly advise you to get a comprehensive and current international health care insurance and evacuation policy. In addition to your insurance, you could consider a temporary membership of the West African Rescue Association (WARA), a private organisation that provides first-world quality emergency response services like medical assistance, and ambulance and air evacuation from anywhere in Ghana. Prices of memberships (also per month, 25 euro for an individual) can be found here. Membership is possible for (temporary) residents of Ghana, but also for tourists. Since July 2007, the currency in Ghana has changed from the Cedi to the Ghana Cedi (Gc, banknotes) and Ghana Pesewas (Gp, coins). Burkina Faso, Togo, Benin and other member countries of the West African Economic and Monetary Union (UEMOA) shares the franc of the Commununauté Financière d’Afrique (CFA, pronounced sefa). All the major western foreign currencies are very easy changeable at the banks or the authorized Forex Bureaus in all major Ghanaian cities. In the francophone countries, there are only few authorized Forex Bureaus and generally, the best exchanges rate is given at the banks. If you want to bring hard currency, bring euro’s or dollars (notes larger than 20 dollars). You can choose Travellers Cheques for safety reasons. However, exchanging them for money is time consuming and nowadays, they are only accepted by a few banks that are only located in the big cities. Withdrawing money from an ATM with a VISA card is much easier than a Mastercard or normal debit card (e.g Maestro Card). A credit card avoids you from carrying a large amount of vulnerable cash and wasting time in banks. At some supermarkets and hotels it is also possible to pay with a credit card (Eurocard, Mastercard, VISA). But keep in mind that some credit card companies will charge you for this service. The exchange rate that is used for Travellers Cheques and credit cards is lower than that of cash. If you are travelling to more rural or remote areas, you need to bring enough cash for the duration of your stay, as there are no banks outside the larger cities. We made a comprehensive packing-list for your convenience. You can download it here (pdf). Easy to wear and easy to wash clothing is advised. White or light coloured clothing is not advisable, because of the red dust. Headgear is not superfluous. Although West Africa has a tropical climate, it can be rather cool in the night and especially during the harmattan season from November till February. Don't forget to bring a cardigan or a sweater if you travel up north. It is also advisable to wear a shirt with long sleeves and a pair of trousers when the night falls; this is to protect you against the mosquitoes. Respect local etiquette. It will earn you respect. Loose and lightweight clothes are preferable to revealing shorts, skimpy tops or tight-fitting wear. Normal sandals are suitable for travelling, but closed hiking shoes are a must if hiking is part of your itinerary. Closed shoes are required in Mole National Park. The making of photographs does not require any special permission, however taking pictures of airports, government buildings and military vehicles is strictly forbidden. Always ask before photographing people (or videoing them). If you don’t speak the language, a smile and a gesture will be understood. It is highly appreciated if you send a copy of the picture to the person you have snapped either straight to the person or to our office in Ghana, so we can distribute it for you. Swimming in this part of the world is not always safe. There are dangerous currents in the Gulf of Guinea, and even though they seem clean, many of the rivers and lakes have been detected to be infested by the bilharzia parasite. These aquatic parasites invade the body through the foot-soles and are a health-hazard. Not all swimming pools are to be trusted, we advise you to discuss any intention to swim with your local tour guide. The voltage is 230 / 250 volts AC 50 Hz. You have to take into consideration that electricity is not everywhere and always available. It is advisable to bring (or even better: buy locally) an adapter for the English or French type sockets. For local calls as well as calling abroad, it is cheaper to use a Ghanaian sim card. It will only cost you one or two euros to get a card and units to recharge can be bought everywhere. The only thing you need to do is to make sure that your phone is unlocked. Giving tips is a common custom in this part of the world to show your appreciation to waiters, porters and local guides. Jolinaiko's drivers and guides are fairly paid, but when you feel the quality of the service was good it is still appropriate to tip. Jolinaiko defines eco-tourism as a healthy, sustainable and friendly mode of tourism, focused on respecting local culture, natural resources and experiencing pure African life. Try not to waste water and always switch off lights and air-conditioning if you go out. Buy locally made souvenirs where possible (but avoid souvenirs made from coral, ivory, skins or other wildlife). Don't give money or sweets to children. It encourages begging and demeans the child. If you have some charity initiatives in mind, kindly discuss with us for advice. Be prepared. Ghanaian standards can be quite different from European standards. You may experience unforeseen occurrences like power cuts and shortages of warm water. The best remedy is to be flexible. The Bradt guide is one of the few good travel guides for Ghana alone (if not the only one). A highly recommended guide, we use it ourselves! The current version is the 7th revised edition, February 2017. The guide also has a review of our own community-based eco destination Atsiekpoe, and our own Cashew Village Lodge. Ghanaians like to do things their own way, and Ghana is a proud country that does not cater exclusively to tourists but rather expects them to fit in with the Ghanaian pace and way of life. Thus a visit to Ghana is not without its downsides, and visitors can experience frustrations and barriers. This revised and updated edition of Culture Smart! Ghana explains the complexities and nuances of Ghanaian society with clarity and humor. The Lonely Planet guide to West Africa covers Benin, Burkina Faso, Cameroon, Cape Verde, Côte d'Ivoire, The Gambia, Ghana, Guinea, Guinea-Bissau, Liberia, Mali, Mauritania, Niger, Nigeria, Senegal, Sierra Leone and Togo. An excellent guide if you are also visiting other countries in the region. The newest version is the 8th edition, September 2013. Personal travel story by Ada Rosman-Kleinjan, and her husband, of their travels through Ghana (Dutch only). A highly recommended guide for Benin. The last version is the 1th edition, April 2006, and it is becoming difficult to find a copy of the book. You could try to get a second-hand version. Erika and Felicie, the authors, lived and worked in Benin for over two years as Peace Corps volunteers. They experienced this fascinating country like few outsiders have before and created a network of locals who all contributed their own specialty and unique insight for this book. A highly recommended guide for Burkina Faso. The current version is the 2th edition, October 2011. “ Being very restless and normally having difficulties sitting still, somehow Apollo (without knowing it) showed me how wonderful it can be to just sit and watch the world go by, and to see how rich and beautiful small things can be.